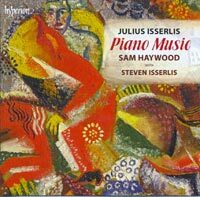 JULIUS ISSERLIS (1888-1968): 2 Ballades, Op. 3, Moment triste, Preludes, Op. 2, Nos. 1, 2, 4, 6-8 & 10, Prelude exotique, Op. 10/2, Toccata in fourths, Op. 10/1, Ballade in A Minor for Cello and Piano (Steven Isserlis [cello]), Skazka, Op. 6, 3 Klavierstücke, Op. 8, Souvenir russe, Op. 9, Capriccio in A Minor, Op. 12, Memories of Childhood, Op. 11, Warum?, Russian Dance, Op. 7. Description: Student of Taneyev and winner of the Gold Medal of the Moscow Conservatory upon graduation, the grandfather of Stephen Isserlis is represented here by his entire compositional œuvre except for one song, two Poèmes for piano and orchestra and three of the Op. 10 Preludes which, for no apparent reason, the Moscow State Library won't let anyone see. Not surprisingly, Russian melancholy and Russian dance are the two elements almost always present with the two Op. 3 Ballades in a direct line from Chopin. The Prelude exotique is humorously "Oriental" and Warum? a poignant tribute to the 11-year-old Julian Scriabin upon his death in a boating accident. Sam Haywood (piano).